I’ve found that for me, writing is a team sport. I only got better and eventually published my novel through the mentorship of talented individuals and through the help of critique groups. 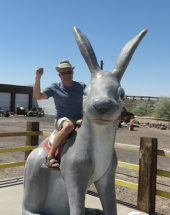 And it was fun to find out than one of the most iconic songs involving Route 66 has a similar history. Jackson Browne had shelved a song called Take It Easy because he was struggling with finishing the lyrics. 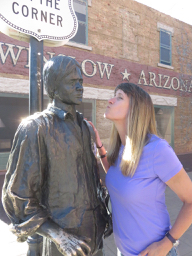 He has written the line, “Well, I’m a-standin’ on a corner in Winslow, Arizona…” but had the proverbial writer’s block. His friend, and then-neighbor, Glenn Frey, had seen an early version of the song and asked him about it. Browne had hoped it would be on his own debut album but confessed that he couldn’t make it work. Frey supplied the line, “It’s a girl, my lord, in a flatbed Ford, slowin’ down to take a look at me,” and the two agreed to co-write the song. In May of 1972, the resulting collaboration was the Eagles first ever single and the opening track on their debut album. Browne released it later and the song is listed in Rock and Roll Hall of Fame’s list of 500 songs that shaped Rock and Roll. 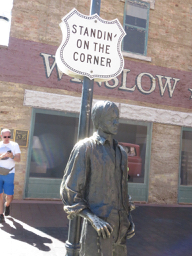 During our Journey Across America we visited Standin’ on the Corner Park in the town of Winslow. 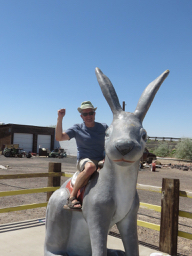 The proud citizens of that small town created a park to commemorate their part in the history. 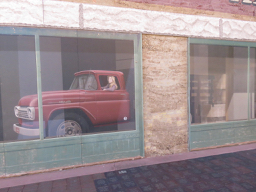 A statue of a male guitar player graces the park and a mural of that girl, reflected in a store window, is behind him. A statue of Glenn Frey is on another corner of the small park. Hey, I though she was slowing down for me! As I was standing on the corner myself, I saw a fine sight of my own—although she was driving a Subaru. You can see the video here. Update. We are back in the Puget Sound area through the end of December. We’ll be doing some backpacking, hiking, and catching up with friends and family until we head to Chile in January for a Spanish Intensive course and some adventures in South America. On our trip, I got some fantastic news: The Last Apostle is a finalist in an International Christian Fiction contest in the debut author category. The honor is really a result of all the talented collaborators who have worked with me over the years and the people who encouraged me on this journey. Thanks to each and every one of you. Welcome home! Good to see you at Mass. Anxious to hear of your adventures! It has been fun catching up with people since we returned. We’ll be in the area off and on until early January. Then expect to spend Q1 of 2018 in Chile and other points south.